Sound "The Aries GM70's performance reminded me of a very good 845 mixed with the sound of a 300B and finished off with a touch of KT88. Translation? The Aries GM70 combines a spacious character with sweetness and drive"; "vocal recordings...were a treat to hear." 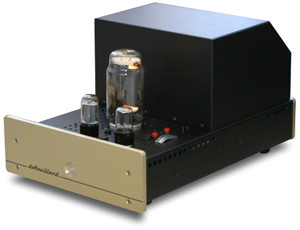 Features Single-ended-triode, class-A, no-negative-feedback design that uses "a triode output tube very new to the audio world," the Ulyanov GM70, "to produce a reported 50 watts"; "each amp employs point-to-point wiring and a bevy of boutique parts, including deHavilland's own GM70 Teflon-and-copper tube socket." Use "A potential weakness" is "controlling large woofers," which was an issue with two Wilson Audio speakers, but the Aries GM70s "can drive dynamic speakers to loud levels"; "the GM70 tube runs very hot, so a pair of [deHavilland's] tube guards will prevent burned fingers and noses." Value "With SET amplifiers, it is now not out of the question to expect your amp to drive speakers other than those traditionally used with such designs. This is, first and foremost, what the deHavilland Aries GM70s allow, and they do so at a price that, while not cheap, does come in below that of [the] competition." As a group, large full-range speakers are the only audio components to exceed the cost of esoteric tube amplifiers. However, the price of tube amplifiers, especially of the single-ended-triode variety, has been creeping upward steadily, perhaps as a function of popularity, with some models over $10,000 and more than a few costing multiples of this figure. SET admirers pay the freight and choose their ancillary equipment carefully in order to capture the unique sound that SET designs offer, building their systems not around speakers, as is most often the case, but amplifiers, and low-power ones at that. Nowadays, many SET amps offer power output that exceeds single digits and therefore do not have the same speaker requirements that their lower-power brethren do: high-efficiency speakers that also present the amps with a high-impedance load. This is good news for audiophiles who do not warm up to the sound of horns or single-driver speakers, but bad news for their bank accounts, as many of these higher-power SET amplifiers are also high-priced amps as well. Located in California, deHavilland has been producing SET amplifiers for a number of years, with one of its past designs, the 22-watt Aries 845, reviewed here on SoundStage!. As we discovered, that amp had some issues driving Bill Cowen's Coincident Speaker Technology Total Eclipse speakers, whose actual sensitivity (86dB as measured in the National Research Council's anechoic chamber) was far below what the company stated (94dB). However, the Aries 845s sounded very nice with my Wilson Audio WATT/Puppy 6es because of those speakers' higher sensitivity (91.5dB as measured at the NRC). DeHavilland has since upgraded that amp to produce 30 watts, and later released the SET Aries GM70 ($7995 USD per pair), which offers even greater power output, a quoted 50 watts into 8 ohms, due to the use of a triode output tube very new to the audio world. The Aries GM70 takes half of its name from the Ulyanov GM70 tube it's built around (and the other half presumably from the first sign of the Zodiac). The GM70 is a Russian import that was reportedly used in Soviet tanks (the scuttlebutt on the 6C33C, another Russian tube, is that it was used in MIG fighter jets). The GM70 is big and hearty -- it looks like an 845 with a flat-top haircut -- and its audio use is natural given that it offers higher gain and more power than an 845. The driver tube for the Aries GM70 is a 6AU5, with a single 12SN7 as the input tube. The amp is a fully class-A, no-negative-feedback design -- two of creator Kara Chaffee's requirements. 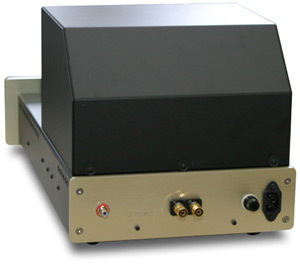 The Aries GM70s are stocky amplifiers, measuring 12"W x 18"L x 10"H and weighing 60 pounds each. The bulk of their weight is in their rear [insert punch line here], which is where the amps' Electra-Print transformers reside, encapsulated in a bulky powder-coated transformer cover that matches the rest of the chassis. Each amp employs point-to-point wiring and a bevy of boutique parts, including deHavilland's own GM70 Teflon-and-copper tube socket, with which, deHavilland claims, "the amplifier sounds like it has 3dB more headroom." Edison-Price binding posts and Cardas input jacks come standard, but for an extra $100 deHavilland will build the amps with Cardas binding posts. Frequency response is stated as 20Hz-35kHz. Standard input impedance is 50k ohms, but deHavilland can tailor this if your preamp works best with either a greater or lesser value. The GM70's gold-hued faceplate is engraved and painted, giving it a very finished look, which the rest of the amp echoes. The GM70 tube throws off quite a bit of light, and the contrasting black of the chassis and gold of the faceplate look dramatic with the lights off and the amps fired up. I used the Aries GM70s to drive two different pairs of Wilson Audio speakers -- WATT/Puppy 7s and MAXX Series 2s -- along with Energy Veritas V2.4i's for a short time. Its power output was adequate to drive all to loud levels, but it was clear that the more sensitive Wilson Audio speakers were better suited for use with the Aries GM70s, as the sound with the Energy speakers was overly mellow by comparison. This didn't sound like a power issue, however, as much as one of the sonic signature of the amps not mating well with that of the Energy speakers. Preamps were a Lamm L2 Reference and Belles 21A with Auricap upgrade. Digital components were a trio of Esoteric units (DV-50, UX-1 and X-01) or the ever-trusty Zanden Model 5000 Mk III DAC and either a Mark Levinson No.37 or 47 Lab PiTracer transport, connected via i2Digital's BNC-terminated X-60 cable. Interconnects and speaker cables were from Nordost (Valhalla and Valkyrja) or Siltech (Signature G6 Forbes Lake and Signature G6 Eskay Creek); power cords were mostly from Shunyata Research (Anaconda Vx, Anaconda Alpha, Taipan and Python), but I did use Siltech Signature G6 Ruby Creek power cords for periods as well. The wonderful Shunyata Research Hydra Model-8 conditioned power and protected my system from AC burps. Racks and stands were from Michael Green Designs, Silent Running Audio, Bright Star Audio, Townshend and Harmonic Resolution Systems. The top-mounted bias pot and meter make getting the amps ready for use a snap. Each amp's RCA input is located on the rear along with the speaker binding posts, IEC power-cord receptacle and fuse holder. Turning on the Aries GM70s engages a delay circuit that gently powers up the tubes, extending their life. Regarding the output tube, deHavilland says, "We run the GM70 tube conservatively and would expect 5000 to 8000 hours of service." In the event that you need a replacement, deHavilland sells these for $150 each with a 90-day warranty and stocks the 6AU5 and 12SN7 in quantity as well. All three of the tubes are widely available over the Internet, too. DeHavilland sells a tube guard for the GM70 ($400 per pair) that resembles a parking garage. It's not attractive to my eyes, but it's worth considering if you have nosy animals or children. The GM70 tube runs very hot, so a pair of these tube guards will prevent burned fingers and noses. Other than some transformer hum from one amp, I experienced no problems with the Aries GM70s. Few things are more exciting in the life of a tube-loving audiophile than hearing an amplifier that uses a new output tube. There are no useful analogies -- this is not like driving a new sports car or trying a new wine. Tubes are nearly sacred objects to the audio flocks, which makes a new output tube the equivalent of, well, a new sacred object. In any case, I was anxious to hear the Aries GM70 and the tube that is its namesake. All audio equipment is the sonic sum of its parts to some extent, even if end users can't identify the individual contributions of each part. But with an amplifier, the output tube does impart a recognizable signature on the sonic outcome. EL34s don't sound like KT88s, which in turn are different from 6L6es and 6550s. In the context of output-tube sound, the Aries GM70's performance reminded me of a very good 845 mixed with the sound of a 300B and finished off with a touch of KT88. Translation? The Aries GM70 combines a spacious character with sweetness and drive. A cut that displayed this well was "Dusty Woods" from Greg Brown's Slant 6 Mind [Red House RHR CD 98]. Here the richness of the opening guitar made me think that the Aries GM70s' presentation would be syrupy, but then Brown's deep voice enters and doesn't sound overly chesty or thick at all. I played this part of the track a few times just to be sure of what I was hearing. Sure enough -- the clarity and drive were present and accounted for amidst the overall sweetness of the sound. After this discovery, I couldn't pull out CDs to listen to fast enough, especially vocal recordings, which were a treat to hear via the Aries GM70s. These amps are also a treat with piano, imparting enough leading-edge definition and speed to be believable, the inner detail and decay to capture the entirety of each note, and the weight to suspend disbelief. Thelonious Monk's playing on Monk's Dream [Columbia/Legacy CK 63536] sounded notably drier than Jessica Williams' on All Alone [MaxJazz MXI 206], but that's as it should be, proving that the Aries GM70s' inherent sweetness doesn't homogenize recordings. All Alone is a terrific-sounding CD of a performance that's at one moment athletic and another playful. Williams is an expert at creating tension and then releasing it, which she does throughout All Alone, which is, as its title suggests, a solo recording. It was utterly beautiful over the Aries GM70 monoblocks without sounding excessively euphonic. Most solid-state amps get low marks for the sheer beauty of their presentation, often sounding more mechanical than musical. The tubed Aries GM70 presents music in all its loveliness. It gives strings a slightly golden tone, which I suppose is a coloration, but one that's seriously enjoyable. First Impressions Music's SACD of Vivaldi's The Four Seasons [FIM FIMSACD 052] is one of the very best-sounding SACDs I've heard, and over the Aries GM70s it took on a sense of liquidity and grandeur that was addictive. Yet, at no point did I hear the amps omitting detail, which was abundant. And that's the thing about these amps -- they don't just make music sound pleasing by glazing the presentation with sonic honey. The detail is there, just not thrust at you, and so is enough power to portray dynamic swings convincingly and drive speakers that other SET amplifiers can't. The Aries GM70s have enough power on tap to push both the WATT/Puppy 7s and MAXX 2s to very loud levels even in my large (20' x 29') listening room. Yes, the Aries GM70s could run out of power -- as they did during a test of how loud the MAXX 2s are able play cleanly (very, very loud) -- but they didn't do so at any sane level, which is an accomplishment for a SET amp. But the MAXX 2s (and the WATT/Puppy 7s) also showed a weakness of the Aries GM70s relative to other tube and especially solid-state amps: controlling large woofers. The MAXX 2s have 10" and 12" woofers, and while bass from the Aries GM70s driving the MAXX 2s never lacked depth or weight (there may be a bump in the amps' bass to account perceptually for this), low frequencies lacked tightness and definition, often sounding more plush than they should have. A good example of this occurs with the song "2:19" on John Hammond's great Wicked Grin [Pointblank Records 7243 8 50764 2 8], on which the opening drum whacks sound overly prominent and fat. I can't say that this effect was universally displeasing -- it helped the Aries GM70s sound better with a lot of raucous rock'n'roll than any SET amp I've heard other than the Lamm ML2 -- but it is a trait worth pointing out. Other solid-state and tube amps I used on the MAXX 2s didn't call attention to themselves down low. However, I don't think all is lost for the deHavilland amps. This tendency with the Aries GM70s was present with the WATT/Puppy 7s, and their 8" woofers, as well, but to a lesser degree, and pretty much a non-issue with the Energy Veritas V2.4i's, whose three 6 1/2" woofers could still provide great bass weight and depth but didn't sound as mushy and tubby as the larger woofers in the Wilson Audio speakers. During the time I was listening to the Aries GM70s, I was lucky enough to have two distinguished mono tube amps, one push-pull and the other OTL, around for comparison. However, those amps, the Lamm ML1.1 and Atma-Sphere MA-2 Mk II.3, cost $22,690 and $33,000 per pair respectively -- nearly three times and over four times as much as the Aries GM70s. However, in a good many ways, the deHavilland amps were competitive with the Lamm and Atma-Sphere amps, offering a view on the music that was different but still very satisfying. to the extreme" and the MA-2 Mk II.3's sound as possessing "abundant purity." The Aries GM70s have more of a sound of their own, due perhaps to the unique signature of the GM70 output tube, than either the Lamm or Atma-Sphere amps, but one that's certainly no less musically involving. The Lamm and especially the Atma-Sphere amps sound more transparent than the GM70s, giving greater insight into SACDs in particular. The Aries GM70s counter with spaciousness and sweetness, and the ability to drive speakers that most SET amps won't. Theirs is a more voiced presentation, one that's very pleasurable but not bleached or threadbare, offering a different sense of accuracy, one that reconstructs performers in the listening room, not gives you a microscopic view into each recording. The Aries GM70s handled loud passages with no obvious deficiencies, but their sound is not as dynamically freewheeling as that of the MA-2 Mk II.3s especially, whose rated output power, to be fair, is over 200 watts. Just the same, the dynamic limitations of many SET designs are absent with the Aries GM70s, which will drive most speakers to loud levels. The MA-2 Mk II.3s excel at the soft end of the range, especially when driving the MAXX 2 speakers, whose dynamic range is gargantuan. The Aries GM70s lose a bit of focus when played at the very low levels that the MA-2 Mk II.3s handle with aplomb, but this is a matter of comparing an amp that's as good as most in this regard to one that's extraordinary. I won't say that the Aries GM70 is the sonic equal of the Lamm and Atma-Sphere amps against which I compared it, but I can say that the deHavilland amps have charms that the other two don't. Taking price into consideration, the Aries GM70s are well worth the effort to audition and may be the amps to anchor your system. As the price of audio equipment rises, so do the expectations of those who buy it. With SET amplifiers, it is now not out of the question to expect your amp to drive speakers other than those traditionally used with such designs. This is, first and foremost, what the deHavilland Aries GM70s allow, and they do so at a price that, while not cheap, does come in below that of competition like the Cary Audio CAD-805 Anniversary and especially the sonically wonderful but very expensive Lamm ML2. Compared to these amps, the Aries GM70s have much to offer, including a sweet, spacious presentation with enough power to portray ample dynamic range and drive. I greatly enjoyed my time with these amps, especially as I reexamined the vocal segment of my music collection, and I have no hesitation in recommending that audiophiles interested in tube sound investigate them. It is obvious that the limitations of most SET amplifiers have not sunk their use in serious audio systems, but amplifiers like the deHavilland Aries GM70 prove that some electronics designers are not merely relying on the aura of SET sound to sell products. The Aries GM70 is a heartier breed of SET amp, and one that doesn't abandon its sonic heritage. Price: $7995 USD per pair. Warranty: Two years parts and labor, 90 days for the tubes. Thank you for a thoughtful and excellent review of our Aries GM70 SET amplifier. We are thrilled to be considered real competition for such august products as the Lamm ML1.1 and Atma-Sphere MA-2 Mk II.3 amplifiers, especially considering that those products are more than two to four times the power, and three to four times the price. It has always been our mission to design products with a high performance-to-value ratio. We worked endless hours to design the Aries GM70 to reproduce gorgeous vocals, which to us is at the heart of so many recordings.We really appreciate your comment that the Aries GM70 is sweet, but not coated with "sonic honey." We feel that sonic detail is very critical , but the detail needs to serve the music, and not the music serve the detail. Your comment that the Aries GM70 reconstructs performers in the listening room is exactly what we strive to achieve. We have two minor technical comments. The mechanical transformer hum you encountered was probably due to the transformer cover being knocked out of alignment during shipping. The simple remedy is to loosen the mounting screws and re-tension them to get the cover quiet again. We have also improved the heater filtering on the GM70 tube, and the ultimate noise floor of the amp is significantly lower, a feature which is incorporated into all current production.